Welcome to new followers! Leave me a comment and I will follow you back! Be sure to enter my current giveaways! 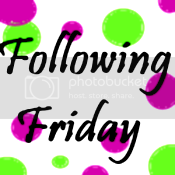 Stopping by from fridays blog hop and I'm your newest follower. Hope you'll stop by and consider following me back. I started following about a week ago – I enjoy your blog! Come see mine and follow back! Thanks for visiting my blog from the Friday hops! I am following back!